There is always something new at The Yum-Yum....from special offerings to special events. So check this page often to know what's hoppin' at the shop and in the community! We'll keep a running list of everything so you can plan to come by....or see what you may have missed and might be able to catch another time. ~ Market Day at The Yum-Yum! With local vendors, handicrafters, live music, old timey games, yum-yummy food & drink, and more. Saturday, May 19, 2018 from 9 a.m. until 2 p.m. See our Market Day page for more details. ~ Music Monday! Due to popular demand, this is now held the first AND third Mondays of every month (unless it's a holiday). Folks of all ages & talent levels who love music either drop in to play or simply to listen. It's from 10:30 a.m. until the last note is played. Come linger as long as you want. It's a fun time to relax and tap your toes with others! The musicians have even composed a song in tribute to our little café! What an honor! ~ Fork Shoals Christmas Parade 2017! We were very merry opening our doors again for this annual Parade in the Country. 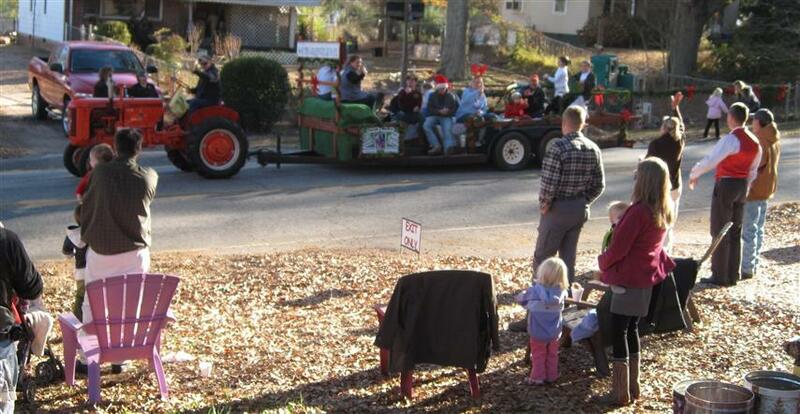 Our front yard is always a prime spot in the heart of Fork Shoals for watching the floats & bands pass by. Spectators enjoy our complimentary hot cider & coffee as they visit with others and enjoy the festivities. ~ Book signing! Deborah Norton, a local author, had a busy day at the shop signing her three books based on true-life events which instill hope & forgiveness. Anyone still interested in purchasing one of her easy reading books ($10 each) can contact our café (864-243-2111). ~ Solar Eclipse viewing! The open backyard of our rural café was stellar for watching this rare event! In addition, our "Music Monday" musicians played a variety of solar sounds, there were free treats & other out-of-this-world specialties as well as family games to entertain guests in anticipation of this heavenly spectacle. Folks from New York to Florida came to enjoy this once-in-a-lifetime day! 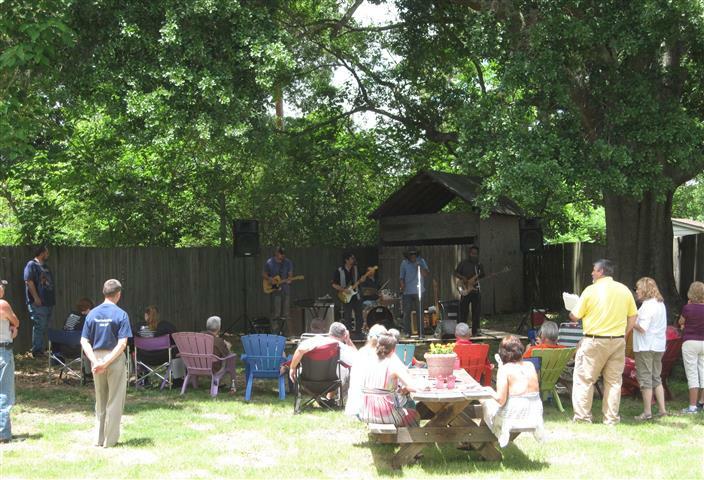 ~ "Bluegrass Saturday" returned in May with "The Rusty Tuners," a very well-liked & incredible SC bluegrass band! It was a wonderful encore to their appearance in February! Many-many thanks to them for coming and making this an outdoor event like none other! ~ "Bluegrass Saturday" was a super hit in February 2017! "The Rusty Tuners," a talented SC bluegrass band, wowed all the guests who filled the shop - inside & out! Stay tuned for encore after encore! ~ 13th Annual Fork Shoals Christmas Parade - It was another jolly old-fashioned, country parade filled with the spirit of community. See our Facebook page for lots of merry photos! ~ Happy 4th Anniversary to Us! It's wonderful to know the folks in Southern Greenville County have more than welcomed us for 4 years now! Let's keep getting better & better...together! ~ Your Carolina with Jack & Megan - Many thanks to them for having us on their show on WSPA-TV. It was a pleasure meeting them and sharing tidbits about The Yum-Yum! ~ "Market Day at the Yum-Yum" in May 2016 was another terrific gathering of local vendors & crafts people. Their unique creations - along with live music by "Vinyl," a very entertaining Upstate band - made for a fun, family-friendly community day in the country! ~ Clemson Tough - Guts & Glory Under Dabo Swinney! A book signing by Larry Williams, South Carolina Sportswriter of the Year, was at the shop Monday, March 14, 2016. He spread the Tiger Spirit and impressed everyone who came. His book continues to be on sale at the shop for only $21.99! ~ Happy 3rd Anniversary to Us! In November 2015, we celebrated 3 rewarding years in Southern Greenville County! Sincere thanks to everyone who has made our endeavor an ongoing success in many-many ways! It is a true joy adding our little bit to this great community! ~ Book signing by David B. Hathcock! This prolific Williamston author showcased his recent book, "He Touched Me," along with his others. He is an honest, fresh, and inspirational writer whose works will leave you thinking. We are pleased to have "He Touched Me" for sale at the shop for only $15. ~ Lunch meeting! Former Lt. Governor of SC & current Sr. Mgr. of Community Relations for Waste Management Bob Peeler joined County Councilman Lynn Ballard over lunch to discuss ways to improve our area of Greenville County. We were delighted they chose The Yum-Yum for their tête-à-tête! ~ 2nd Annual "Fork Shoals Market Day!" What a happy & social community day this was! From local vendors & crafts people to live music & old timey games, there was something for everyone of all ages. We thank the crowd who came and helped revive the spirit of Fork Shoals (artisans & shoppers alike) and look forward to next year's event! ~ Southern Greenville County Citizens Group! These concerned citizens have met periodically at the shop to do what they can to improve safety in our area. Teaming up with the sheriff's office and other officials is making a positive difference. ~ "Moms in Prayer!" This group from Fork Shoals School came together many times to bring about purposeful, positive results for students, teachers, and families. It was a blessing to us to be able to host them. ~ Commissioners of Canebrake Fire Department! It was our pleasure to specially open our doors for this board who recently met at the shop to elect officers. Many thanks to all they do for the betterment of our community. ~ Happy 2nd Anniversary to The Yum-Yum! It has been a real treat for us to be part of the Fork Shoals community & Southern Greenville County. Sincere thanks to everyone's ongoing enthusiasm & response. Our official anniversary was Friday, November 14, 2014, and it was our pleasure offering everyone specials to show our appreciation! ~ The Flamingos! They've flown the coop and no longer flock routinely at the shop. It was our pleasure hosting them for over a year. ~ Celebrate America! The true American spirit was felt throughout the shop June 30 - July 3. There were all sorts of red, white, & blue things and good ol' American things! Like, hot dogs, ice cream, lemonade & apple pie...along with our regular Yum-Yum specialties. As a nod to the former mill days in this village, we were closed July 4 & 5 like back then so folks could celebrate with family & friends. Most of all, remember to always do your part to preserve the freedoms & opportunities on which our country was founded! ~ Community Clean-Up! Our semi-annual Fork Shoals Clean-up Days have been sweeping successes! Many thanks to the coordinator, Gloria Hughey, and all the residents & Yum-Yum gals who pitch in to make our community shine even brighter! ~ Fork Shoals Market Day! What a fun day & community success! Area vendors & artisans had a super selection of quality treasures for sale in the backyard of The Yum-Yum, Canebrake Fire Department welcomed visitors to their truck on display, Cedar Falls Baptist made vehicles shine at their car wash, and Tommy Hamrick closed the day with toe-tapping guitar music. It looked like everyone enjoyed filling up with lunch, snacks, drinks - and The Yum-Yum spirit, too. A huge thank you to all who came and for the encouragement to have another one again...and again! ~ Meet & Greet your candidates! For the special election for our County Council rep in District 26 of Southern Greenville County, our doors were open Saturday, April 5 & 12 as a courtesy for the community & candidates to get to know one another. It is always our pleasure to do what we can to help make our area the best it can be! ~ Our One Year Anniversary! And what a rewarding first year it was! All your congratulatory notes, cards, gifts, drop-ins, & calls made us feel that we just may have brought exactly what you wanted to the area. To thank everyone, snacks & baked goods were 50% off on November 14, 2013. Let's have another fun-fun year together! ~ Trick-or-Treat Night! Our doors creaked open on Halloween for all the little goblins who dared to fly in on their broomsticks for some ghoulish goodies. Everyone had a boo-tiful time! ~ Trunk-or-Treat Fest! Many thanks to Tractor Supply for inviting us to their fall festival...and to all who stopped by the mini-version of our shop there. It was a cauldron full of fun! ~ Our 6 month anniversary celebration! There was lots of fun-fun at The Yum-Yum! From the ribbon-cutting ceremony & old-timey games to the free drawings & performance by world-renowned "Mac Arnold & Plate Full O' Blues," there were smiles & toe-tapping all around. Thanks to everyone for coming & letting us show our appreciation for your help & support! ~ Easter fun for our youngest guests! 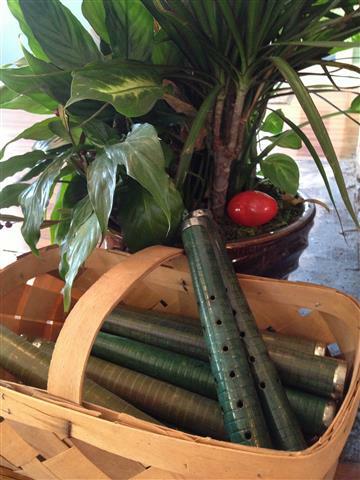 There were some "eggs"traordinary surprises scattered throughout the shop. Children hopped on in to "find" out about them! ~ Another book signing! On March 23, 2013 from 1-3 p.m. at Costco in Greenville, there was a book signing for Fork Shoals. It was another chance for you to meet the local authors and pick up this inviting history about the former mill village and the southern part of Greenville County surrounding it. ~ The Hincapie Spring Training Series! On Saturday, February 16, 2013, the shop opened its doors during the bike race so the riders and their support teams could cruise in for a snack. ~ Book signing! 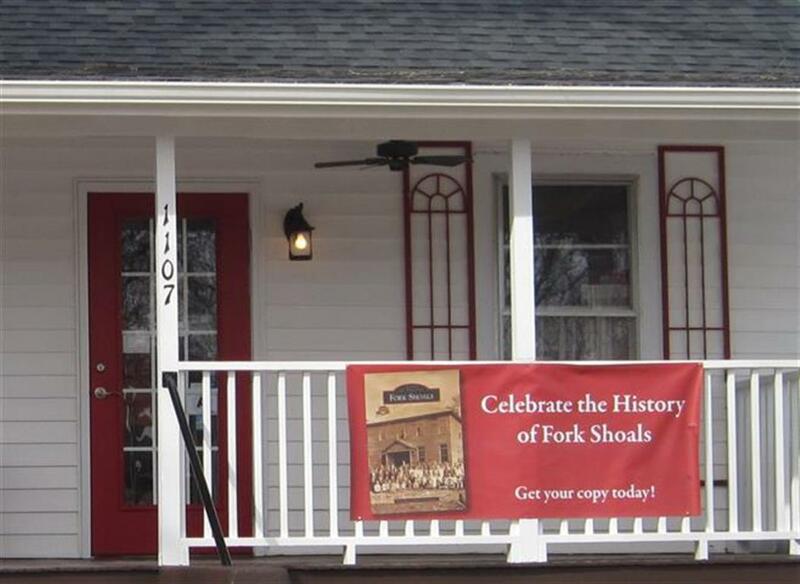 On Sunday, February 10, 2013, the book signing at the shop for the new book Fork Shoals was a community success in many ways! Crowds of folks reconnected with people & places in the book as well as with neighbors they hadn't seen in a while. All the enthusiasm was thoroughly appreciated by the authors! ~ The Fork Shoals Christmas Parade! Every year, the shop specially opens during the annual Country Christmas parade. It's a merry time in the shop and out front - with Santa & Mrs. Claus dropping in, too!